Well, looks like I didn’t get into TOJam this year due to a lack of space and resources. Maybe next year will be better. Even though, my team may still go ahead with the project we already planned out. Time really flies you’re eagerly awaiting something. I haven’t been working on Gonna Catcha as much this past week, mostly because I was distracted by the Toronto Game Jam that is happening next weekend: coming up with ideas and eagerly awaiting the confirmation email. Today, I received note that my team was still on the waiting list of participants (they received ~100 more registrations than spots available). Here’s hoping that additional spots will become available in the coming week. The last thing I was working on for Gonna Catcha was the pathfinding for the Vengeful (left) and Bashful (right) spirits. It turned out that the grid-based pathfinding system makes some assumptions on how you’ve setup you sprites, objects and levels (the wording in the documentation does hint to this). 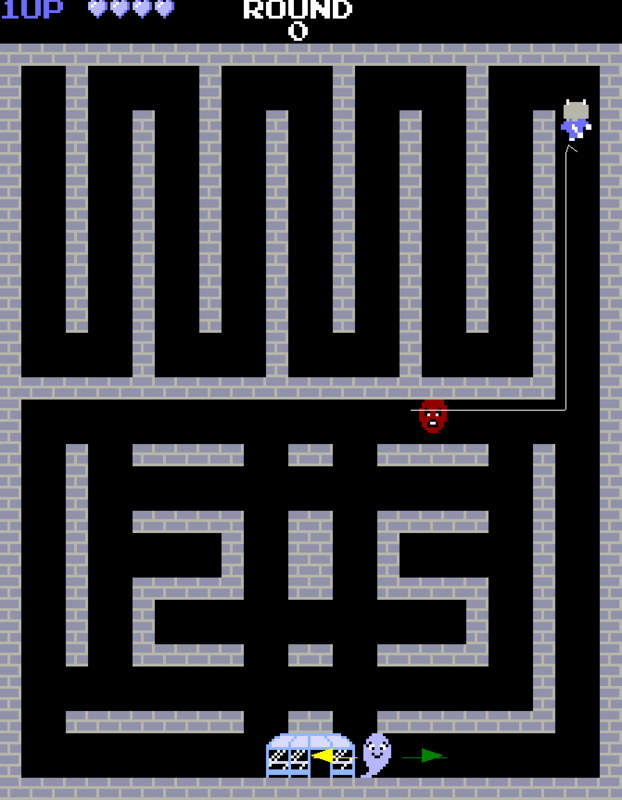 To get the best results, you’ll need to design your game to accommodate the pathfinding system. Unfortunately, Gonna Catcha is not one of those games. It bows down to no one. 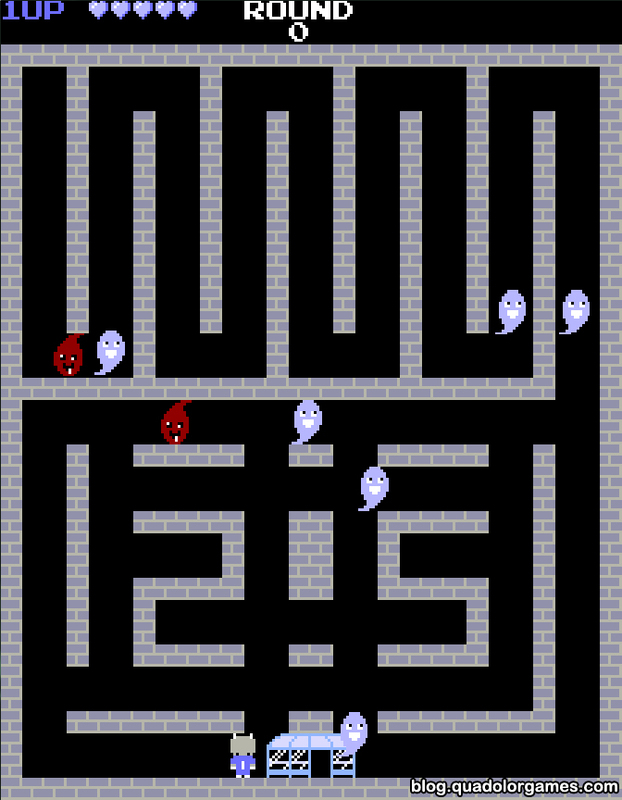 One of the major issues that I saw in the tests was that the Vengeful spirit sprites were overlapping the walls as they moved through the maze. This is because the pathfinding algorithm doesn’t take the size or origin of the sprite into account when finding the optimal path. I did manage to find a combination of sprite settings and cell size that eliminated the overlap (in the bottom-right image), the latter happened to be the old 16×16 cells that I previously abandoned for stifling my creativity. There were other nit-picky things that didn’t make the built-in pathfinding system suitable for Gonna Catcha, so I ended up coding my own. It’s not as sophisticated as the built-in system, but it gets the job done. 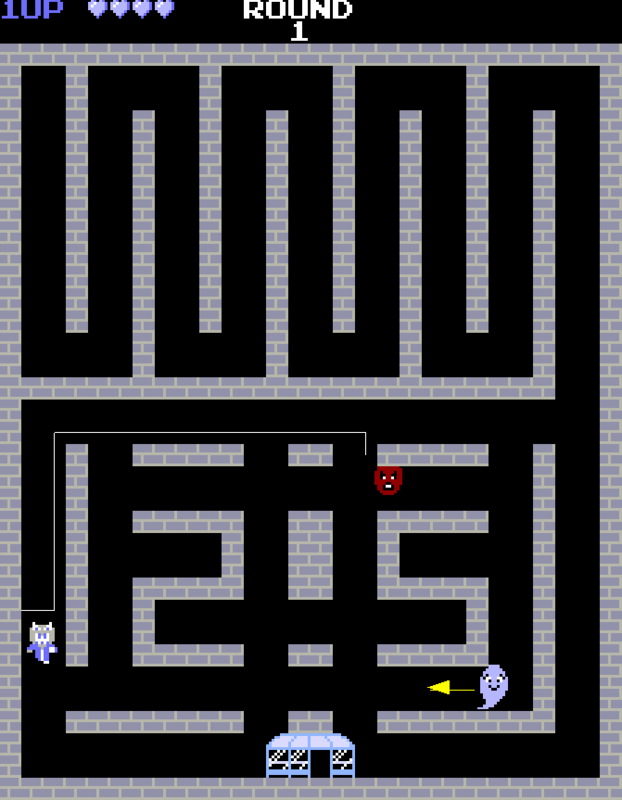 In addition, it solved the problem of coming up with a pathfinding algorithm for the fleeing Bashful spirits (which GameMaker doesn’t have natively). All I did was invert the Vengeful spirits’ algorithm. UPDATE 9/3/2013 – The content of this post has been promoted to a full-fledged page here. As promised in the previous post, I will be talking about the items and power-ups that will be in Gonna Catcha. Allows the player to have two shots on-screen at a time. Extends the range of the player’s shots. Gives the player an additional hit point. Causes all spirits and ghosts to stop temporarily. Grants the player extra points. 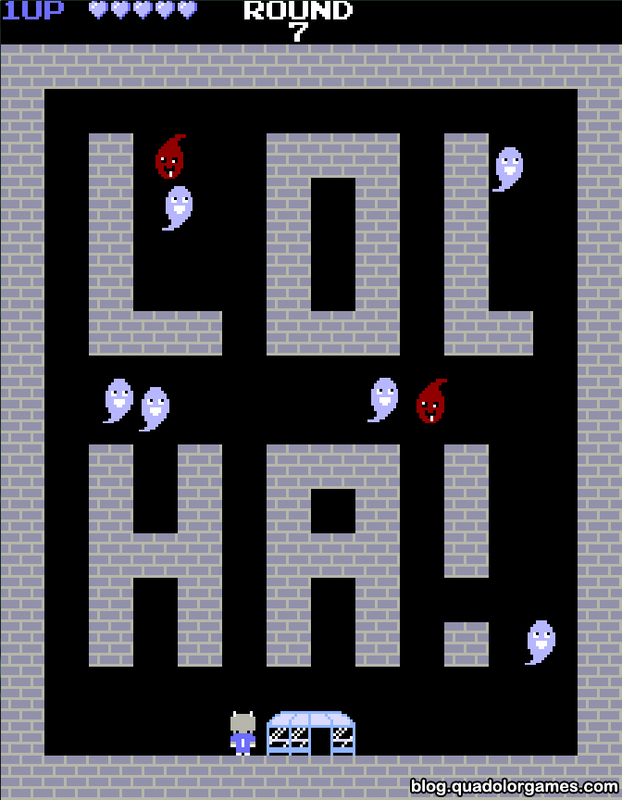 Is Gonna Catcha the reincarnation of an actual arcade game? More news at 11. I’ll have an update on the progress of the game up in the next few days (I hope). I created a a new and improved game description page here, to replace the old, outdated blog post describing the game. You can also reach it by clicking on “Project Gonna Catcha” on the bar above this post. Let’s look at level design (sorta) and the 鬼. Er, I mean GUI. This post will be a bit brief, as the things I’ve done with Gonna Catcha are rather simple and better expressed in a series of images. Internet speak into a level’s design is SOOOOO gauche. This might be a little overboard. The addition of a round timer below the round counter. To my knowledge, all arcade games have a way for it to reliably to bring itself to a game over state, in case the player(s) abandon the machine mid-game. That way, it wouldn’t waste precious quarter-sucking time. For many arcade games this comes naturally, by having enemies that persistently chase and/or attack the player(s) until all lives are lost. For games that don’t have that guarantee (Gonna Catcha included), a round timer is used to make sure the game ends.